the Pick-Up Method, the Magic “No Ends" Method, and the Russian Join Method. Video Demonstrations included! They say you can’t teach an old dog new tricks. When I was working on these tutorials and trying the different methods of casting on and working the different stitches I realized that sometimes there are other ways of doing things and these new methods just might make your life a bit easier or better! One of the new things I learned is how to join a new skein of yarn using the Russian join. I’ve been knitting for years and have used the method of just picking up the new yarn, leaving a tail and weaving in later. The problem with this for me was that I worried the the join was less secure. I’ve never had a problem with it but when I researched the “Russian join” I liked how it felt a bit more secure and was super easy to do. Having said that, there are other ways to join new yarn and I have instructions for three different methods below. Everyone has a different idea of what feels right to them and it may even vary depending on your project. Experiment with these methods and let me know what your favorite “joining” method is. This method involves tying your yarn together in a way that is super secure and essentially makes the two strands of yarn work as one. It allows you to join a new skein of yarn without having to weave in ends! Even some yarn manufacturers will use this kind of knot when yarn breaks in the factory. Put your two pieces of yarn side-by-side and pinch them in between your thumb and forefinger about a quarter of an inch from the ends of the yarn. Take the yarn from your new skein of yarn and wrap it clockwise around your thumb and pinch it with the other strands of yarn. Wrap the yarn again and put this new wrap of yarn on top (closer to the end of your thumb) of the first wrap. Take the yarn and bring it in between your thumb and the two ends of yarn. Take the two ends of yarn and tuck them around the last wrap that you made in step 4. Tug on the yarn that's attached to the new skein of yarn and remove your thumb. Tighten, and you've got your magic no-ends knot! 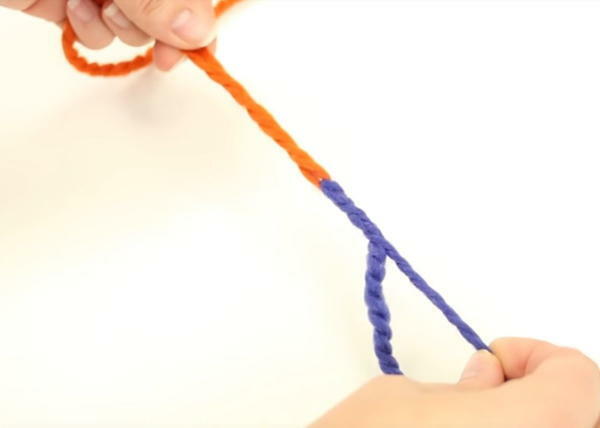 If you thought the magic no-ends knot was magical, wait until you hear about the Russian join! It might seem, at first, like it wouldn't work or that the yarn would slip out, but it's still more secure of a join than simply picking up a new end of yarn. Not only will you not have ends to weave in, but there is a minimal amount of yarn that is wasted in this join. You might notice that there's a slight bump in your work when you're knitting back over this join in the subsequent row, but this should not show on the finished work itself. Plus, over time the yarn will felt into itself, making it even more secure. Thread your tapestry needle onto one of your skeins of yarn, giving yourself about a two-inch tail. Turn your needle around and push it in between the plies of the yarn. Pull the tail of yarn through the plies. You should still see a little loop of yarn and the end. Take the tail of yarn from your other skein and bring it through the loop of yarn that you just made. Repeat steps 1-3 for your other tail of yarn, threading it back into itself through the plies. Trim your tails that are sticking out from the yarn. Now you've got a continuous join of yarn and no ends to weave in later! After trying each of these three ways to join yarn ends, which one will be your go-to method?